Parks department purchase of Maple Street Garden is moving through public review! The Department of Parks and Recreation announced on April 4 that it has begun the official process of buying Maple Street Community Garden, 237 Maple Street between Rogers and Nostrand Avenues in Prospect-Lefferts Gardens, Brooklyn! Parks’ press release below and here. The April 4 announcement marks the beginning of the Uniform Land Use Review Procedure (ULURP) for the garden’s acquisition. 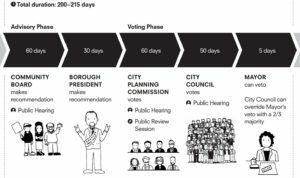 ULURP is a process that NYC uses to make sure elected officials and the public review big land use decisions; the City Charter requires ULURP any time the City wants to acquire property. This procedure includes input from the local community board, borough president, City Planning Commission and City Council, with many opportunities for public input through public hearings and other forums. 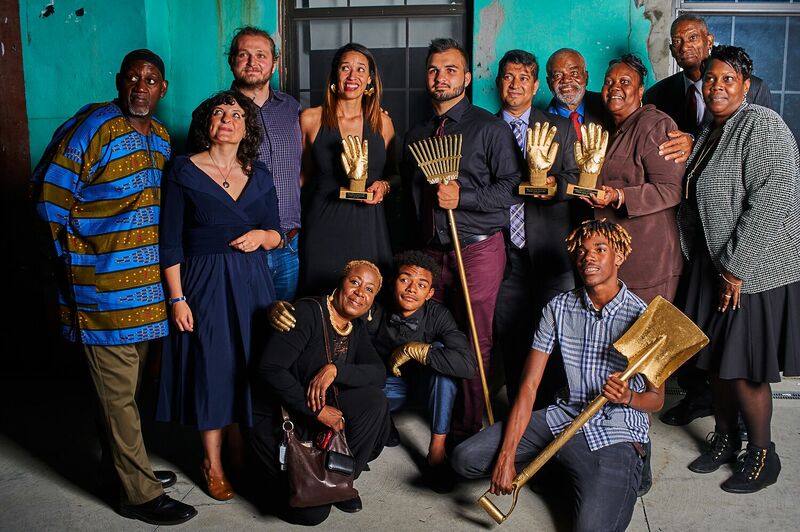 The announcement follows a multi-year community land access advocacy campaign supported by 596 Acres which brought together community gardeners, elected advocates and city agencies to create and secure a vital Brooklyn community space. Neighbors organized to transform an abandoned privately-owned lot on their block into a community garden, creating open space to grow food and BBQ under a grand weeping willow. This tree used to stand next to a house, which burned down in 1997, years after its last owner passed away without children to directly inherit it. When gardeners were threatened by eviction from speculators with a dubious deed, 596 Acres connected gardeners to probono legal representation and successfully staved it off, while helping track down legitimate heirs. Acknowledging the importance of this community space, Council Member Matthieu Eugene and Borough President Eric Adams each set aside funding for the land’s acquisition. Public hearings, and their results, are listed below! Join local advocates testifying in support of NYC Parks’ proposal to secure this community resource at the next one! Plug in with maple3garden@gmail.com, or just show up with two or three minutes on why this space serves our city. Parks Department’s press release follows. See photos of the garden from last summer here. Brooklyn Community Board 9’s ULURP Committee – VOTED YES after the public hearing on April 19! Full Brooklyn Community Board 9 – VOTED YES on April 25! PDF here. Brooklyn Borough President ULURP Hearing – VOTED YES on May 24! PDF here. City Planning Commission (CPC) ULURP Hearing – June 21: Photos of incredible testimony here. VOTED YES on July 27! PDF here. Read about it in the press here. Next stop: City Council ULURP vote. Stay tuned for announcement! An overview of the ULURP timeline, including public hearings. This process started on April 4, 2017. Thanks to the Center for Urban Pedagogy for the graphics! Full page here. NYC Parks is pleased to announce that the City is one step closer to acquiring Brooklyn’s Maple Street Community Garden with the official Uniform Land Use Review Procedure (ULURP) certification now complete. This milestone is a crucial step in getting City approval to acquire the site. Located at 237 Maple Street, the garden is a midblock lot which sits between Rogers and Nostrand avenues, and has served as a passive open space and maintained as community garden by neighborhood residents since 2013. Brooklyn Borough President Eric Adams and City Council Member Mathieu Eugene have allocated $1.25 million toward the acquisition, which would facilitate the continued use of Maple Street Community Garden as a passive open space and community garden. Once the ULURP process concludes, the acquisition could be completed by mid-2018. “This is an amazing step in the journey! We are so glad to support grassroots, community-led development of this neighborhood and to facilitate partnership with Parks and our elected advocates that will allow the preservation of the Garden for generations to come,” said Founding Director of 596 Acres Paula Z. Segal. 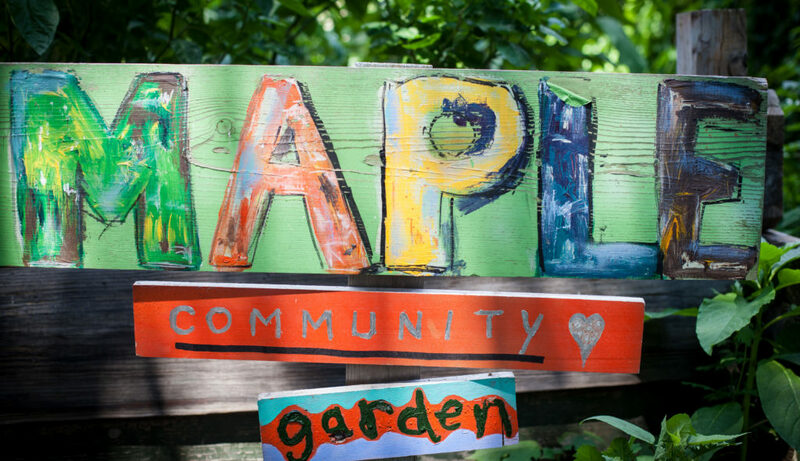 Since 2013, Maple Street Community Garden has been used as a passive open space and community garden by neighborhood residents. Previously, the site had been vacant since the demolition of an unsafe building on site, which was damaged in a fire and demolished by NYC Department of Housing Preservation and Development in 1997. The lot sat vacant between 1997 and 2013, when neighborhood residents raised funds and worked to transform the lot into a community space to grow fresh produce and provide open space by removing debris, building gardening beds, and landscaping the site. GreenThumb provides programming and material support to nearly 600 community gardens in New York City. Workshops, which are the access point for supplies, are held every month of the year, covering gardening basics to more advanced farming and community organizing topics. GreenThumb was initiated in response to the city’s financial crisis of the 1970s, which resulted in the abandonment of public and private land. The majority of GreenThumb gardens were derelict vacant lots renovated by volunteers. These community gardens, now managed by neighborhood residents, provide important green space, thus improving air quality, bio–diversity, and the well–being of residents. But gardens aren’t just pretty spaces; they’re also important community resources. 596 Acres champions resident stewardship of land to build more just and equitable cities. 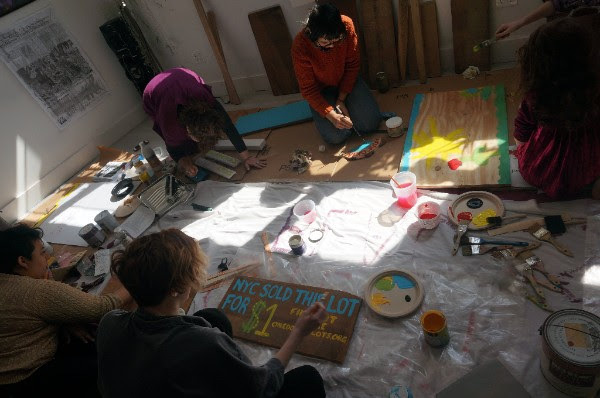 596 Acres builds tools to help neighbors see vacant lots as opportunities and create needed green spaces that become focal points for community organizing and civic engagement. 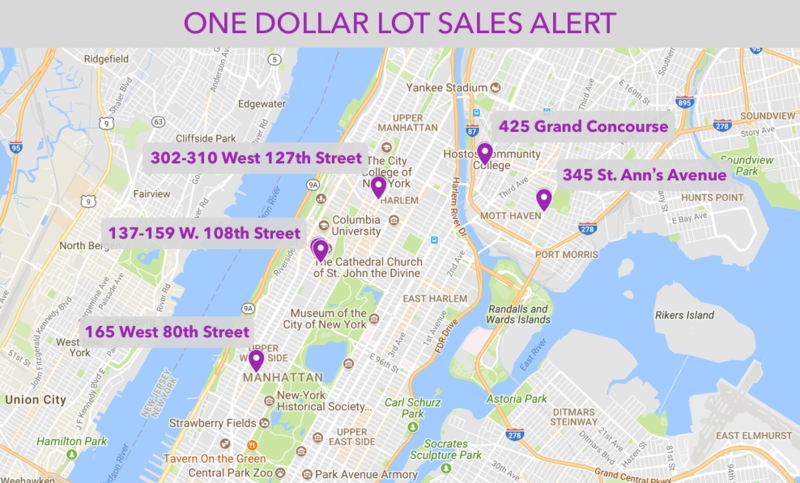 We turned our original online map into a sophisticated interactive organizing tool, Living Lots NYC, which provides information about vacant land across NYC and is supported by signs and other print materials. These materials go hand in hand with our ongoing organizing and advocacy work.